A broad smile replaced a tentative look after a second-grader at Eastwood Elementary School in East Alton learned how to multiply for the first time. Her teacher, Southern Illinois University Edwardsville junior Ashley Scottoriva, could not help but to let her own face erupt into a big grin. Approximately 60 SIUE elementary education teacher candidates completed their final Eastwood Before School Math Group Instruction on Friday, Nov. 2, according to Barbara Martin, EdD, assistant professor in the School of Education, Health and Human Behavior’s Department of Teaching and Learning. Eastwood students receive a free breakfast in the gym each day before school begins. Martin thought it would be good to introduce math into the equation. SIUE elementary education majors selected those interested in learning and strengthening their math skills and took them to a separate room to play math games. After approximately 15 minutes, the future educators returned to the gym for the second and final group of the morning. The program was offered on Mondays, Wednesdays and Fridays from Sept. 14-Nov. 2. SIUE students worked with more than 100 elementary learners. In another case where a student was reluctant to try her hand at multiplication, Katka gave her a gentle nudge. 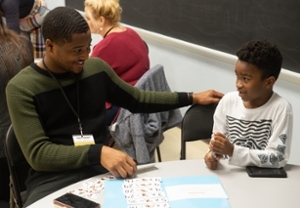 “The extra practice that SIUE students provided our elementary students was evident on their STAR (Standardized Test for the Assessment of Reading) monthly scores,” noted Smith. The SIUE School of Education, Health and Human Behavior prepares students in a wide range of fields including community and public health, exercise science, nutrition, instructional technology, psychology, speech-language pathology and audiology, educational administration and teaching. Faculty members engage in leading-edge research, which enhances teaching and enriches the educational experience. The School supports the community through on-campus clinics, outreach to children and families, and a focused commitment to enhancing individual lives across the region. SIUE junior Tyler Wheeler and Eastwood student Zayden Baisull talk multiplication.